Kebabs are an easy summertime meal that you can make with just about anything you have in your fridge. Meat, tofu, or even just vegetables are skewered on a stick and grilled. 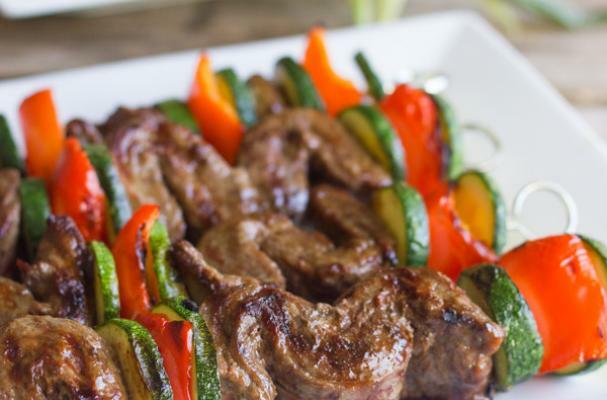 When cooking kebabs, especially with meat, there are a few tips to keep in mind. Invest in a set of metal skewers. They are reusable and you don't have to worry about burning them. Also, make sure your ingredients are room temperature before grilling to ensure and even cooking. Once off the grill, give your kebabs a few minutes to rest before serving them to friends and family. These halloumi vegetable kebabs prove that meat-free kebabs are delicious in their own right. Seasonal vegetables and halloumi cheese are soaked in olive and fresh vegetables before they are grilled. Halloumi is a fresh Greek cheese that can be purchased at a specialty foods store or Middle Eastern market. These tasty chicken skewers pair well with all your favorite barbecue sides. I like to serve mine with macaroni and cheese, potato salad and baked beans. When cooking these kebabs, be aware of the temperature because you don't want the sweet marinade to burn the chicken. Flank steak is an inexpensive cut of meat that can feed a crowd. The key the achieving tender pieces of flank steak is to cut is against the grain (opposite from the meat fibers) and don't overcook it. For these kebabs, the meat is marinated in a mixture of soy sauce, ginger and honey before it hits the grill.